The RAD ETX-203AX Carrier Ethernet demarcation device delivers SLA-based business services to the customer premises over native Ethernet access networks. dedicated Internet access and Layer-2 LAN-to-LAN services, all with differentiated quality of service and end-to-end monitoring. and enforce traffic SLA. ETX-203AX features hardware-powered OAM for multiple flow monitoring at line rate. It provides 15 different SLA tools to assure and control service provider traffic around the clock. RAD's ETX-203AX is a compact demarcation device that delivers MEF 9 and MEF 14 certified services. It provides Ethernet uplink NNI ports as well as UNI ports. 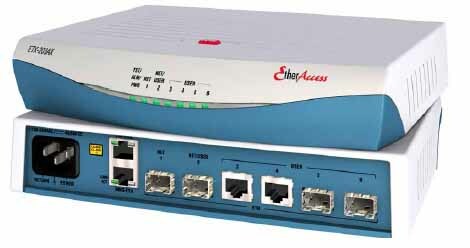 ETX-203AX is used as an Ethernet demarcation device. 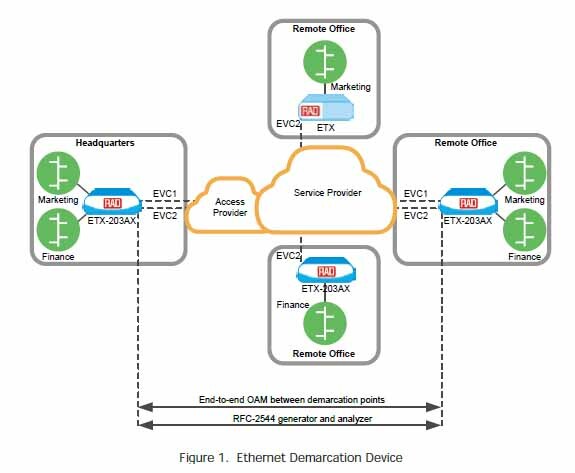 ETX-203AX separates the service provider network, the access provider network, and the customer network, providing proactive service monitoring and easy fault localization throughout the entire network (see Figure 1). all-to-one bundling), VLAN ID, VLAN priority, IP precedence, DSCP, Ethertype, and IP/MAC source/destination address. Classification is defined for both VLAN tagged as well as untagged traffic. network, to peer supported protocols (IEEE 802.3-2005 and LACP), or to discard the L2CP frames. · Non-disruptive MAC and IP level loopback testing of network integrity. · Single-segment (link) OAM according to IEEE 802.3-2005 (formerly 802.3ah) for remote management and fault indication, including remote loopback, dying gasp with SNMP trap, and MIB parameter retrieval. Active and passive mode are supported. · End-to-end service and performance monitoring based on ITU-T Y.1731. Fault monitoring and end-to-end performance measurement include delay, delay variation, frame loss and availability. Different service types require different levels of QoS to be provided end-to-end. QoS can be defined per subscriber as well as per service. QoS has three aspects: rate limitation, traffic shaping, and traffic prioritization. user-configurable CIR + CBS and EIR + EBS. Traffic can be limited to the line rate or the data rate. Every flow per EVC or EVC.cos has its own queues and scheduler supporting strict priority and weighted fair queues (WFQ). eligible-enabled) as well as color-unaware networks. Integrated management of MiRICi smart SFPs provides TDM (E1/T1/E3/T3/OC-3/STM-1) connectivity over PDH or SDH legacy networks. ETX-203AX supports configuration and statistic collection for the smart SFP TDM port. SNMP trap, thus enabling the unit to properly disconnect from the network with notification of the reason for the service problem. OAM failure message. The fault propagation mechanism enables routers and switches connected to both ends of the link to reroute the traffic to the redundancy path. · Dual homing (1:1), allowing ETX-203AX units to be connected to two different upstream devices. end to end. The standard implementation ensures interoperability with third-party devices. With standard APS functionality, Ethernet OAM messages provide bandwidth-efficient unidirectional or bidirectional 1:1 protection. The EVC protection path can be configured on the same network port, enabling the transport network to provide an alternative path for the working and protecting path. It can also be configured on separate network ports, adding protection at the access layer and enabling load balancing on network interfaces by splitting traffic between the two network ports. The performance of the hardware-based Ethernet OAM together with protection switching for physical layer failure ensures fast protection in any scenario. The flow level protection provides a full set of manual commands for maintenance purposes. · SFTP (secure file transfer). · Out-of-band management via a dedicated management port. · Remote inband management via user or network ports routed via separate VLANs, Telnet, or an SNMP-based management system. Databases and scripts of commonly used commands can be easily created and applied to multiple units using command line interface. Traps are sent with sequence IDs to network manager groups, to enable the managers to detect when traps are lost and request the traps be sent again. DHCP client functionality. This enables seamless node setup and configuration for quick and scalable network setup and deployment as well as configuration consistency when nodes must be replaced. over multiple flows, at the EVC.CoS level. Enhanced RFC-2544 functionality provides service-oriented KPI analysis. SLA conformance is measured per service bandwidth and packet size, within a user-defined amount of time, for faster service introduction. Layer-2 and/or layer-3 network integrity can be tested by a non-disruptive loopback performed per flow, with swapping of MAC address and optionally IP address. When the loopback is activated, ETX-203AX exchanges the source and destination MAC/IP addresses of the incoming packets. This loopback passes through Ethernet bridges (MAC address) and routers (IP address).